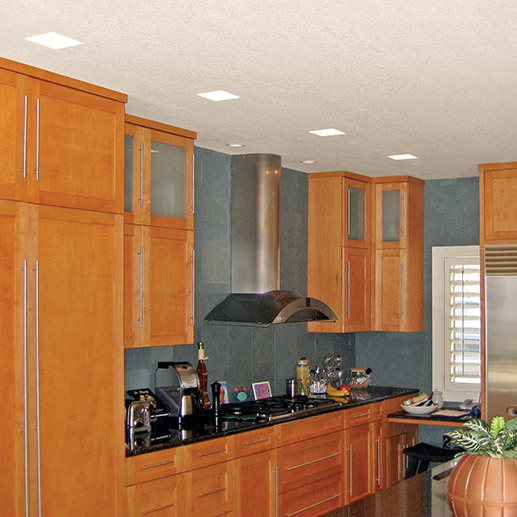 The Vance Residence carried the modern lines of the contemporary kitchen through to the lighting with the clean minimal look of the square aperture “Hole in the Ceiling” fixtures. The 8″ aperture fixtures were used for general lighting and can easily be dimmed to fetch that midnight snack. The cast GRG (Glass Fiber Reinforced Gypsum) portion of the fixture blends with the ceiling, while the metal fixture housing attaches above. "Hole in the Ceiling" – HITC Series, Square 8"